We see a tremendous opportunity in shares of Remark Holdings (NASDAQ: MARK) today, as broader market weakness and what appears to be a piling on of opportunistic short sellers have pushed MARK shares down over 30% the last two weeks without any negative company or industry news. The shorts’ aggressive tactics have pushed the shares so far today that they just triggered NASDAQ’s “uptick rule” for the day and MARK shares are trading well below the levels they traded prior to the company’s most recent update revealing the company’s new Fintech product that had led to multi-million dollar contracts with three large banks in China. We see Kankan’s Fintech division as likely worth significantly more than $10 per Remark share based on its existing products and management has indicated that we should see more new offerings in the near future. While short sellers and other speculators have tried to use unsubstantiated accusations and false innuendo to spook Remark investors, we think holders of MARK shares would do well to take a hard look at the CP Group’s investment in Remark shares last month. CP Group is arguably one of the savviest and most opportunistic acquiror’s in the history of Chinese commerce and you can be sure that their due diligence process is significantly more rigorous than anything an individual investor or even what most institutional investors could put forth. They paid $12 per MARK share to take down $10 million worth of Remark shares. CP Group did this before the stock had ever traded that high and they did it knowing that they would have to hold those shares for at least a year before they could sell them. CP Group made this investment because they know that by December of 2018, the stock will be worth substantially more than the $12 they paid to acquire them. Remark shares are worth much more than $12 per share today and we believe they will be worth substantially more in the near future. Remark Holdings’ shares are dirt cheap below $10 and today’s trading is offering an opportunity that may not be around very long. Is LMFA About To Go Blockchain? There has been significant chatter recently about LMFA and whether the company might be preparing to pursue blockchain initiatives. We have done a very deep dive investigating this question, doing everything from reaching out to management to reviewing every message board post, Tweet, Twit and financial article we could find over the last few months that mentions LMFA. 1) Talk that LMFA is going blockchain in a hard pivot – like RIOT Blockchain (NASDAQ: RIOT) or Long Blockchain (NASDAQ: LBCC), this rumor has LMFA chucking its existing business and starting to pursue some blockchain based business model. It appears that there were rumors of such a move by LMFA back in November and the stock rose from below $2 to $6.65. The stock gave it all back as days went by with no announcement of such a change from the company and no corporate action that would indicate such a pivot might be in the works. 2) More recently there has been chatter about LMFA taking its proprietary software and tweaking it to work with distributed ledger technology (blockchain) to improve several broken real estate transaction processes (for example marking the short sale process more transparent, secure and transformed to a smoother process generally). This would be made available to condo associations and banks, ostensibly opening up the company’s current business to tens of thousands of new customers, potentially growing the business exponentially. #1 LMFA is arguably a better prospect for a #1 than the several who have done that very thing (see the chart below). It has a much smaller number of publicly held shares than all the others and it has few shares outstanding than all but one. Additionally, the current market value of all publicly traded shares is at a ridiculously cheap sub $2m price tag. Looking at it from this perspective, a hard pivot doesn’t seem that far-fetched. #2 This talk was interesting in that it seemed reasonable that a small, conservatively run company might start a blockchain initiative like this to build its existing business. 1) NYC based Esousa Holdings LLC, which is known for investing in blockchain pivots acquired all LMFA long term debt outstanding and converted to equity over the last few weeks. 2) Esousa acquired a similar equity stake in Net Element (NASDAQ: NETE) in the months prior to their pivot to blockchain technology in December. 3) NETE is very simliar to LMFA – FL based, Nasdaq listed company with market cap around $10m and float of < 4 million shares. 4) NETE pivot announcement pushed stock from $4 range to $33+ before settling into trading range around $10. 5) The “Master Exchange” to convert LMFA debt to equity was scheduled to price the stock based on formula related to trading price through February 11 (60 days after start date) but Esousa elected to have that changed from 60 to just 15 days less than a week after seeing the pivot announcement push NETE from $4 range to $33+. 6) Company has been unusually silent. We reached out to the company twice over the last 10 days and the company did not respond. This leads us to believe they could be working on something big that they are not quite ready to talk about. “LM Funding America, Inc., together with its subsidiaries, is a technology-based specialty finance company”. A small step, but we have to ask what has changed or is changing that makes the company add “technolgy-based” to their intro line? 8) LMFA’s capital structure, status as one of smallest Nasdaq listed market caps available, small number of shares outstanding and tiny public float make it one of the best prospects for a pivot – even cleaner than some of the recent high profile blockchain pivots (RIOT, Long Blockchain, Netease, etc.). In summary, we think LMFA is tremendously undervalued and possibly on the verge of a pivot that would bring much more attention to the LMFA story. We think the stock is undervalued whether that occurs or not, but if it does we could see the stock moving much higher in a very short time frame due to the limited number of shares that are in the public float to meet a significant uptick in demand. LMFA’s public float (1.01 million shares) is a little less than 1/2 the size of Net Elements’ (NETE) public float, less than 1/4 the size of Long Blockchain’s (NASDAQ: LBCC) public float and less than 1/6th the size of Riot Blockchain’s (NASDAQ: RIOT) float. Each of these companies saw a huge spike in share buying and prices following their pivot and each had significantly more shares than LMFA to meet that demand. Adding to the share supply shortage is the fact that nearly 1/2 of LMFA’s 1 million share float is already sold short.. These short positions could be subject to forced buy-ins if LMFA surges in value similar to what we saw with NETE, LBCC or RIOT, meaning that brokers would be aggressively bidding to buy shares to cover those positions, battling traders and investors who are buying to establish a long position. If this “perfect storm” of buying emerges LMFA stock could surge to levels few could contemplate in any normalized trading scenario, in which case those investors who buy LMFA shares at current levels could potentially earn very significant double or even triple digit returns. We have received a number of questions about the public float of LM Funding (NASDAQ: LMFA) since yesterday’s press release announcing the master exchange agreement. LMFA exchanged its $4,741,601.40 debt for 2,676,378 shares of its common stock. Thus, the total shares outstanding for LMFA increased from 3,300,000 to 5,976,378. However, according to the agreement the shares issued were not registered so it appears that it did not increase the shares available to be traded day to day, or the “public float”. The public float for LMFA remains at the 1.01 million shares that existed prior to the exchange agreement. Of course, this number is extremely important to investors and traders because it represents how many shares are actually available to be bought and sold each day. This takes on even more importance given the number of shares of LMFA that have been sold short, with 41-51% being reported by the Nasdaq in its last two reports. It is quite rare to see a NASDAQ listed company with a float as small as 1.01 million and it is equally or even more unusual to see a company with nearly 50% of its public float sold short. LMFA could rally 50% or more to pre-default levels due to conversion of all debt to equity on favorable terms. Tiny public float of 1 million shares w/ 51% sold short could cause exaggerated move higher on uptick in buying interest. Today we are announcing our new focus stock to the Groove community – LM Funding America (NASDAQ: LMFA). LMFA is a small company whose stock has recently fallen to $1.50 per share, breaking down from the $4-$8 per share range it had traded over the last two years. LMFA’s stock price was eviscerated over the last few months when the company began to miss payments on its long term debt. The downdraft accelerated with what appeared to be year end tax loss selling that pushed the stock to historical lows. The stock has continued to trade near to those lows despite the fact that all of the company’s long term debt was converted to equity on very favorable terms over the last few weeks. With a clean balance sheet, a significantly reduced cost structure in place and a very significant vote of confidence from a notable third party investor; we would (at a minimum) expect to see LMFA’s stock trade back to a range more in line with its market cap prior to the events of default on its debt. 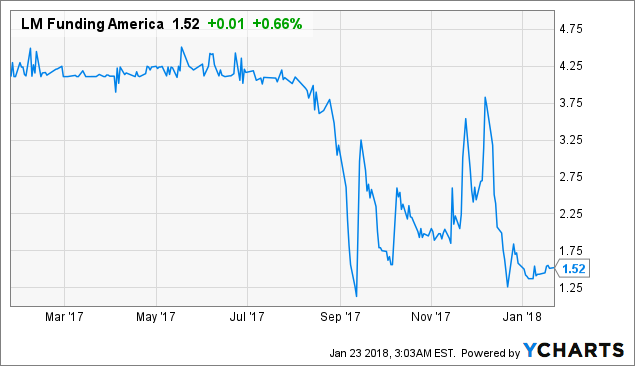 Using LMFA’s historical trading range of $4 – $6 per share and adjusting for the additional shares issued with the debt exchange, that would put LMFA’s shares in the $2.25 – $3.35 range or 50-100% higher than its price as of yesterday’s close. Groove participants can review our full due diligence report on LMFA by clicking here. In summary, we believe that LMFA is significantly undervalued and that the current trading range offers a great opportunity for Groove community participants to establish a stake in a company that could offer returns of 50% or more when the stock starts to reflect the company’s improved outlook. If any other positive developments were to surface, the jaw dropping short interest (511,000 shares or 51% of the entire public float) outstanding could become a major factor driving share prices much higher as it appears that it would not take much for a short squeeze to materialize. Regardless whether that occurs, we think LMFA is dirt cheap and Groove community participants who buy at these levels should enjoy significant upside soon. Rave Restaurant Group’s (NASDAQ: RAVE) stock surged Friday, closing up 19% after rallying almost 50% in early trading on volume that was more than 20x normal volume. This on the heels of a 10% move the prior day on 5x normal volume. Have investors realized that RAVE appears to be back in growth mode? With new Pie Five locations opening in Miami, New Jersey, San Francisco and Baltimore over the last few months while the stock has continued to trade at prices that suggest bankruptcy is imminent, one could argue that the stock is finally just catching up with the operational outlook. Pie Five is growing and new CEO Scott Crane has the company at the forefront of the fast casual pizza space in terms of innovation. In addition to opening in these many new high profile locations over the last few months, Pie Five has also been the first in the space to offer a drive through, delivery, adding sandwiches to the menu, adding a 14″ shareable pizza and adding a super healthy cauliflower pizza crust. While it is still too early to see the revenue implications of any of these initiatives, we do believe that CEO Crane is leading a turnaround with RAVE and that the stock had not adjusted to reflect this potential. But was the move at the end of last week a flood of recognition from investors that things are turning around? Probably not. The speed and fury with which traders were piling in to RAVE stock Friday morning (so much so that the NASDAQ halted trading briefly) suggests to us that it was something else entirely. There were posts in various online forums suggesting that RAVE was about to switch its customer rewards program to a blockchain based cryptocurrency reward program similar to what Chanticleer Holdings (NASDAQ: BURG) announced last week. Prior to that announcement on January 2, BURG’s stock had been very thinly traded in a range of $1.90 – $2.60 for months. On the blockchain rewards announcement, the stock surged to over $5 per share and traded many millions of shares and it has since settled in to a trading range over $3 with much higher average daily volumes. We think traders were looking at a thinly traded, small float, big short interest stock that was oversold and decided to buy in on the chance that it might be the next big blockchain mover. Had the company actually announced such a deal, we would not have been surprised at all to see RAVE shares make a similar move ($5+) though it would have likely given much of that back in the same way that BURG and many of the others have done. So if we get a Wednesday morning PR that RAVE is “going blockchain”, we think the stock will move even higher on the economics of huge demand vs. small supply. And while the move may only be short lived, traders who bought shares below $2 will likely be rewarded handsomely in such a surge and if it plays out like the many others before it, RAVE would settle into a trading range much higher than the $1.40 – $1.50 range where this all started. And we think the company’s operational momentum already justifies a double digit percentage upgrade to that trading range.